The New York Times Bestseller List is not treating me well lately. While Téa Obreht’s debut novel is impressive for a young writer, it ultimately fails to create solid, interesting characters. The biggest stumbling block is that it lacks a definite plot; as a substitute, Obreht packs it with scenery, wandering, and contemplations on death. There are moments of brilliance, but as most of these occur in the beginning, the last fourth of the book is a tough slog. 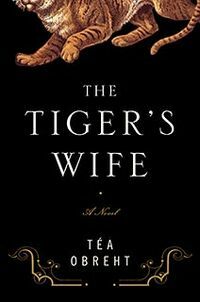 I was reading on the train and wearing my enormous please-don’t-speak-to-me-if-I-don’t-know-you headphones, when a woman in the seat in front of me turned and asked what I thought of The Tiger’s Wife because she’d heard it was brilliant. I hemmed and hawed, not wanting to be too harsh when I hadn’t finished it yet. I finally said that the story was fragmented across a number of individual tales and if these were to come together meaningfully into a single, cohesive work, then yes, it would be brilliant. Unfortunately, these stories do not come together. In the final chapters, connections are forged between them, but they’re only a network of coincidences of which the characters themselves are not fully aware. If these stories weren’t meant to come together cleanly, it would have been more interesting to present them as interlocking short stories rather than building them concurrently and jumping between them, always at the interesting moments and sacrificing momentum to build it elsewhere. Tiny hints surface throughout the novel that something will bloom from the collective stories, but it never comes to fruition. The connective tissue is the grandfather, a common character in several of the stories, but as he is represented at a different stage of his life and acts radically different in each, he doesn’t feel like a single character. This is why the lack of true connections between the stories is so keenly irksome: they can’t even work in concert to flesh out a single character without making him seem like a collection of men. Further, he isn’t terribly dynamic in any of his stories and seems more like a bystander which makes him good for a narrator, but that’s Natalia’s role. Right? As Natalia narrated her grandfather’s narrations, I couldn’t help thinking that one or both of these characters were disposable. Overall: 3.3. This is going to be my standard grade for a middling work. It’s not openly objectionable. I don’t resent having bought it and the first 3/4 fly by. Hopefully, if you go in knowing that it’s fractured, it’ll seem a better book. There are sections of genuinely nice writing and her back story for the abusive butcher was as good as the sections featuring the tiger. Obreht gives a mean man a background that makes him sympathetic without excusing him. That’s a hard line to write. Translation: Read it if it’s a borrowed copy or bought used on Amazon. If you’re buying it new, take a sledgehammer to your expectations or you’ll be able to think of a whole lot of better uses for your $15 ($17 Canadian).